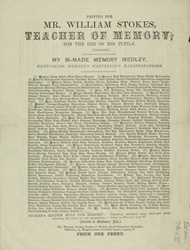 This is an advertisement for William Stokes, teacher of memory. The 19th century was a period of progression both socially and technically. Education had been made compulsory for children aged 7-10 years of age and many adult education colleges were established which offered tuition in the principal skills of reading, writing and arithmetic. The ethos of self help and improvement was important, especially to the middle classes who were constantly trying to better their social standing. Tuition in skills such as memory would have been very appealing, Stokes claimed to be able to teach his pupils his technique in just 3 hours. Stokes offers lectures that could be attended by both men and women, this was unusual for the period.